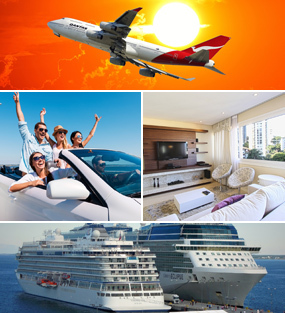 Plan vacation or business trip with eTravel.com and search best offers, cheap rates and discounts on hotels rooms in Las Vegas. Find your next great offer and book your perfect hotel in Las Vegas. On this page we give you information related to hotels and activities available in Las Vegas, Nevada, United States. How is the Las Vegas City? Las Vegas, also known as the “Entertainment Capital of the World”, has so many fun things to do and see besides casinos. Nestled in the heart of Nevada desert, this Sin City offers entertainment larger than life. The Strip is where you will find all the action, casinos brimmed with slot machines and game tables, live performances, endless shopping, fine dining experiences, to all night entertainment. You can travel around the world in a single day at Vegas, with the famous gondola ride at The Venetian, fountain shows running throughout the day at Bellagio, roller coaster ride at New York-New York Hotel, mesmerizing city view atop the Eiffel Tower at Paris Las Vegas Hotel, enthralling Cirque du Soleil show in several hotels around town, or dive into the five pools complex at MGM Hotel decked with waterfalls and grottos. For a world-class cuisine, head to Stratosphere where you can also enjoy 360-degree view of the city at Top of the World Restaurant. And when you are done with all these amazing activities, drive down to the scenic Red Rock Canyon for a hiking day. Alternatively, visit the Hoover Dam, which is about an hour’s drive from Las Vegas, to see the largest man-made lake, Lake Mead. What are the Popular Attractions in Las Vegas? When in Las Vegas, casino is not only for the professional gamblers. Take a fun shot at the slot games or try your luck at roulette. Catch one of the several shows, right from circus to acrobatics to musicals with spectacular dance performances. Vegas is also one of the top cities for conventions, thanks to the gigantic meeting spaces it has. So if you are lucky, you can attend some exhibition or expo or a trade show while there. Spend the night in style by zooming through the neon illuminated Strip in a limousine. The most happening area in Las Vegas where all the clubs, casinos, colossal hotel resorts and other attractions are is the Strip. So if you want to stay in style, take up a penthouse in MGM, Atria, Bellagio, Caesar's Palace, et al. If you are holidaying with kids in Vegas, Henderson is a great district with several parks and kid friendly restaurants, away from the gambling scene. If traveling to the city for a convention, it is best to take a business suite in the same hotel where you are attending the event. How to Enrich Your Las Vegas Experience? If planning to take helicopter ride to Grand Canyon while in Vegas, make the reservation in advance, you might run out of luck otherwise. Shuttle buses and taxis are the common transport mode and are quite safe. The Las Vegas Monorail is air conditioned and provides free resort to resort commute. The Strip is four miles long, so walking all around wouldn’t be a great idea. Check the distances before you head out. Do not buy drinks in the casino as most of them offer free drinks for the visitors to encourage them to play more. Taxi wait time is pretty high, particularly during the peak dinner time. Consider it before you head out. Dress comfortably, especially in peak summer time. Keep water bottle and sun screen handy when you intend to walk through the Strip. Most of the businesses here are open 24 hours, so you can treat yourself with breakfast at 5 PM or sip on the cocktails at 9 AM.